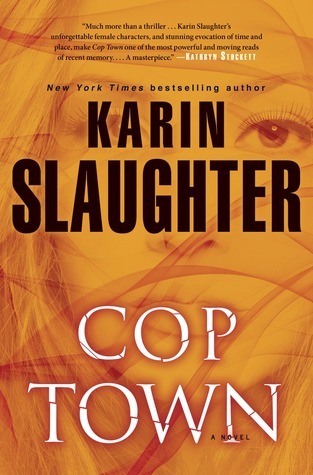 Karin Slaughter, author of the New York Times bestselling Will Trent novels, is widely acclaimed as “one of the best crime novelists in America” (The Washington Post). Now she delivers her first stand-alone novel: an epic story of a city in the midst of seismic upheaval, a serial killer targeting cops, and a divided police force tasked with bringing a madman to justice. Cop Town, is a story that is taking place in the 70s in Atlanta. The characters are fictional but after a while you forget and start to wonder if these really are people that you may have known at one time or another. The story focuses on Maggie Lawson and her family. They are a cop family and the city is in the mist of someone killing cops, so far five. This story is mostly from her point and a new female cop starting named Kate, as the book goes along you get each ones back story plus you get to fell what it must have felt like when females were starting in any police force and what they were up against at the job, streets, and home, oh I forgot each other also. Another thing I liked about this book is if toy were like me and can still remember the 70s, the author really brings you back to that area and all of the ling go and the description of clothing, music, cars, just so much this really made the story feel real. She also brings out the sights, sounds, and smells of not only the streets but also of the police station and the jail. If you have worked in any of these she really brings you back to that place at least for me. There really is a different smell. Working in law enforcement she really grab the friendships and working conditions of the officers, also the conflicts that they may have had as well. Over all I thought this was a very outstanding story and I don’t want to give away anything, so I hope you take the time to read this book. I got this book from net galley.